We are keeping our eyes peeled for creative products for Macs with Thunderbolt ports. One that came to our attention was the Helios Thunderbolt Expansion Chassis. You can plug in a half-length, single-wide PCI Express (PCIe) card and thereby create a custom Thunderbolt device. One use of the Helios suggested by OWC is to install their Accelsior PCI Express SSD. We decided to benchmark that setup along with the Apricorn Velocity Solo x2, a PCIe adapter that accepts any SATA SSD. There are other PCIe host adapters that work with the Helios but these two adapters are compelling since they create a super fast external Thunderbolt storage device for any Mac with a Thunderbolt port. Also these two PCIe SSD cards also show the potential bandwidth this expansion chassis provides. The Retina MacBook Pro was the test "mule." 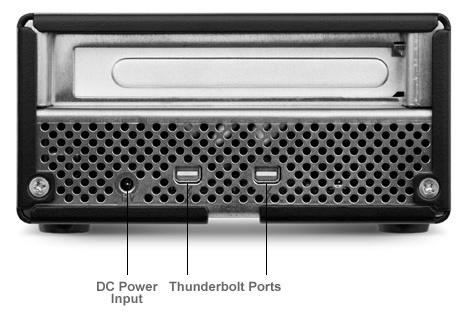 Its built-in Thunderbolt port was used for connection to the OWC Helios Thunderbolt Expansion Chassis. The combo of the Helios and the Accelsior was "lethal." It matched the speed of the fastest Thunderbolt storage devices we've tested. Why so fast? The Accelsior uses Dual LSI SandForce SF-228X processors with High-Performance Tier 1 Synchronous-NAND. Though we tested the 120G model, you can get capacities up to 1 Terabyte. A reader brought the Apricorn Velocity Solo x2 to our attention. If you already own a fast SSD, it provides a way to adapt it as a screaming external storage device for $99 (in addition to the Helios). Sonnet Technologies has a similar product to the Helios called the Echo Express SE. They also have a similar product to the Velocity Solo x2 known as the Tempo SSD. They make the Tempo SSD Pro but it is a full length PCIe card -- won't fit in the Helios or Echo Express SE. 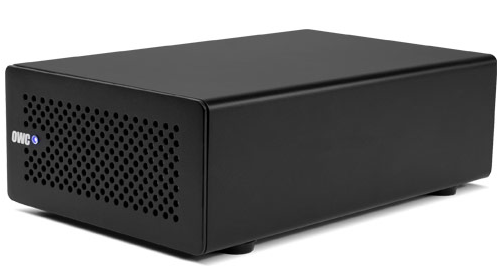 If you have full length PCIe adapters and/or want to mount more than one, Magma makes a Thunderbolt PCIe Expansion Chassis that handles that requirement. WHAT OTHER PCIe CARDS DOES THE HELIOS SUPPORT? Types of PCIe cards Helios can use include: Fibre Channel, 10Gb Ethernet, RAID controllers, Video capture, Digital audio, SAS controllers, and FireWire, USB 3.0, eSATA host adapter cards. Click here for compatibility list. Though the Helios may not interest you, the Accelsior and Velocity Solo x2 should get your attention since they provide a way to create a super fast boot drive or scratch drive that takes full advantage of the 6Gbps solid state storage products. BOTTOM LINE: The Helios is a fast and flexible way to provide workflow options for your 2011/2012 MacBook Pro, 2011 iMac, 2011 Mac mini, and 2011/2012 MacBook Air that were previously only available in the Mac Pro tower. Other World Computing sells various configurations of the Helios. Order Sonnet Techonologies' Echo Express SE and Echo Express Pro direct from them or their dealers like OWC.